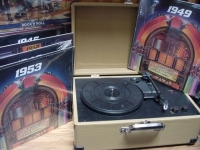 Music Hall Turntable Shop MyMusicFix!! 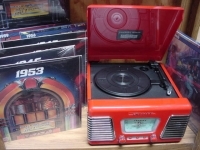 "Retro Autorama Turntable with 16 LPs"
"Retro Suitcse Turntable with 16 LPs"
The Music Hall mmf-2.1 turntable is a 2-speed (33 & 45 speeds) belt driven audiophile turntable at a budget price. It is constructed using high quality components and it comes complete with an arm and Gold Elan cartridge mounted at the factory. The construction of the mmf-2.1 has been simplified to focus on the critical components; the bearing, the motor, and the arm. It comes complete with cartridge mounted.